2016 Young Scientist Challenge Finalist and Winner Maanasa Mendu's Presentation. 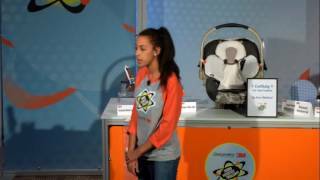 2016 Young Scientist Challenge Finalist Sofia Tomov's Presentation. 2016 Young Scientist Challenge Finalist Rohan Wagh's Presentation. 2016 Young Scientist Challenge Finalist Sara Makboul's Presentation. 2016 Young Scientist Challenge Finalist Rohit Mital's Presentation. Meet the Discovery Education 3M Young Scientist Challenge finalists, mentors and judges at the 2014 final event. 2014 Challenge Finalist David Cohen's Presentation. 2014 Challenge Finalist Sahil Doshi's presentation. 2014 Challenge Finalist Mythri Ambatipudi's presentation.